The play-call was nearly identical to the Patriots’ reverse pass earlier in the second quarter. The Patriots tried a trick-play pass to Tom Brady in Super Bowl LII, but it didn’t work as planned. So leave it to the Eagles to try nearly the exact same play in a much more high-stakes situation — and pull it off for one of the most improbable touchdowns in Super Bowl history. Coach Doug Pederson, who has shown a willingness to gamble on fourth down, sent the Eagles’ offense out onto the field on fourth-and-goal from the 1-yard line with 38 seconds left in the first half and a 15-12 lead. Nick Foles took the snap from the shotgun and handed off to running back Corey Clement, who then tossed the ball to backup tight end Trey Burton. 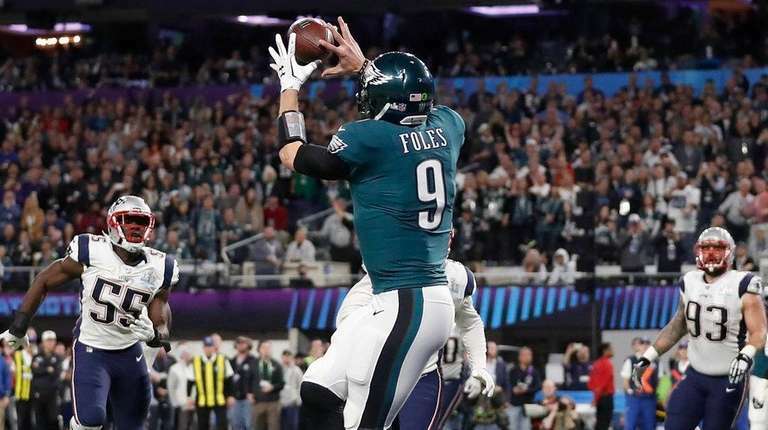 Foles leaked out uncovered in the flat to the right side of the end zone, and Burton lofted the pass to the Eagles’ quarterback, who made the catch for the score. It was nearly identical to the Patriots’ trick play earlier in the second quarter. On that play, a wide-open Brady dropped the reverse pass from receiver Danny Amendola. The score gave the Eagles a 22-12 lead, which they took into the half.